Comment : Bernanke’s speech yesterday disappointed dollar bulls, indicating that interest rates will remain at current levels at least until the middle of 2010 and high unemployment will continue weighting on the economy. 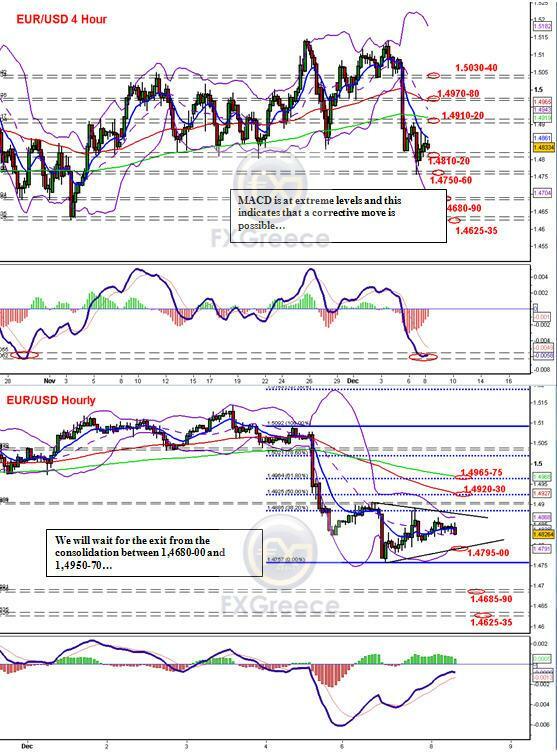 Euro rose during his speech, towards 1.4900, but the gains were quickly erased. We believe that even though we didn’t see the short term downtrend reversal yesterday, the bearish sentiment that was caused in the market after Friday’s NFP report, will gradually start to change. Technically, the upward move was weak and priced could were not able to remain above 1,4800, forming a sideways consolidation (as you can see in the hourly chart). 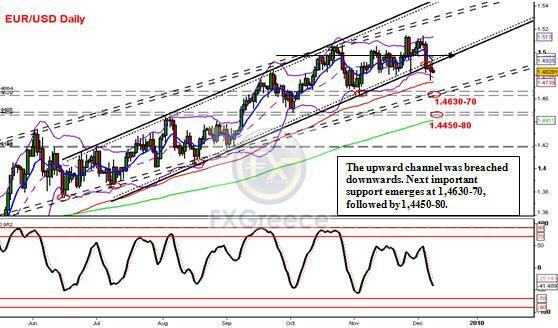 However, the ascending channel that was formed during the last weeks, has been breached downwards (daily chart), and this fact allows a move towards 1,4650 area, which is considered as the next important support level below1,4800.This area will come into focus after a clear break of 1,4800. A change in the sentiment, as we mentioned above, indicates that an upward reaction towards 1,4950-70, could be possible, and the upward break of 1,4900 will confirm it. The rise is likely to be limited at 1,4950-70 or 1,5000-20 area. *STRATEGY: Our strategy yesterday was confirmed and today we will try small buy orders at current levels (1,4815-20), adding positions at 1,4780-90, ad placing stops below yesterday’s lows. Our target will be at 1,4870-80. Buy orders will be tried at 1,4690-4700, adding positions at 1,4650-60,and setting stops below 1,4600. Target will be at 1,4900.